The the little Palm trees are little water decals. Now if you remember yesterday's post was about full nail wraps being water decals. This however is just a little one, which makes it a bit more manageable. Still wasn't easy or fun, but it was better. The back of its packaging explained how to do it, the front of the packaging said just peel and stick on to your nail. So that may be confusing to some, but the back is correct the front is not what so ever. Also for this look I put on Temix Peel Off Base, and it went on nicely, and normally. Didn't have any issues with the application. Now removal is a bit of a different story. So the major glitter packed nail came off ok. The top half peeled off, but the bottom half was a bit hit and miss. I did use it on all the nails that had glitter, but it really didn't work on any but the glitter packed one. :( I tried to peel them all off but it just wasn't working well. 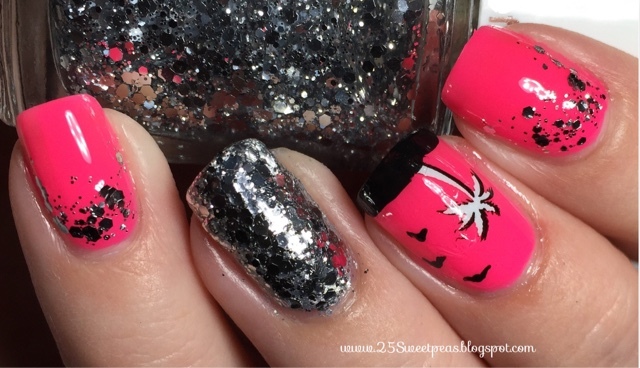 It reminded me of when I was starting nail art and I was looking for a good base and I couldn't find one that didn't "peel". So I really wasn't all that impressed with the peeling. Plus, when that wouldn't work I used remover and that was terrible, it took forever to come off, and I'm still not sure it is all gone! My nails felt bad too. You know how it feels when you accidently peel off a polish because its chipped and looks bad, yet soon as you do it you regret it because now you nail feels bad? Well that was the after wards feeling. No more pictures to share but I would like to tell you what polishes I used! So the lovely pink is China Glaze Heat Index. The chunky silver is Essie Set in Stones layered on top of Essie Loophole. Now over all for these Born Pretty Products, I did not care for the peel off base. 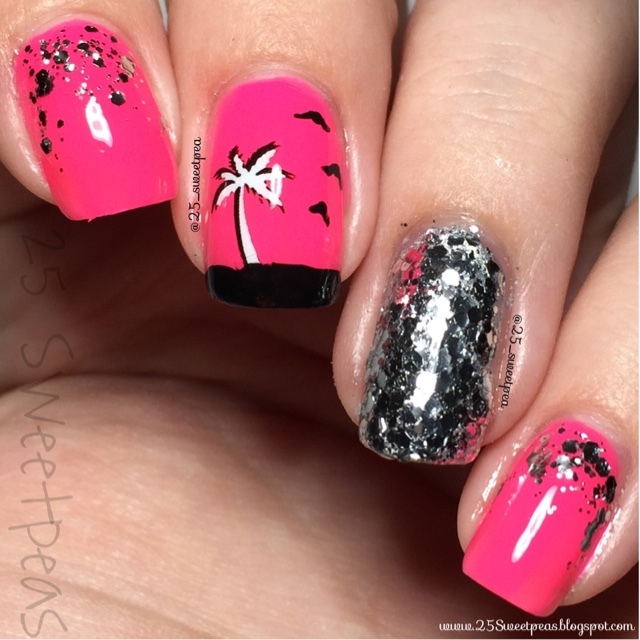 The little water decals were ok, but I personally feel painting a palm tree on would be much simple!